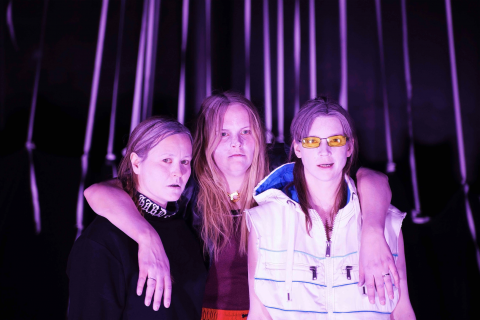 SPOILER is the latest and highly acclaimed production of the trio Berstad/Helgebostad/Wigdel which premiered at Black Box Teater in February 2017. First as students and later as performers and choreographers, they have cultivated a strong academic and artistic mutual trust. This thrust has been giving them courage to continue developing a playful and intuitive way of working where no idea is too hysterical, vulgar, inflammatory or childish to be explored. Their last production Soil Girl premiered at Black Box Theatre in 2013. In SPOILER Berstad/Helgebostad/Wigdel explores the outer and inner noise; how they can affect and harvest each other and how this can be developed through body movements and expression. Berstad/Helgebostad/Wigdel enters into an unknown universe and seeks the distorted, the darkness and the playfulness. There is no security, no immediate recognisability, but a world with countless layers of unexplored mechanisms and conditions. The uncompromising length and noisy silence suddenly breaks up by a chaotic landscape that pushes all boundaries. The distorted effect gets the ugliness and the grotesque to be poetic and almost beautiful. 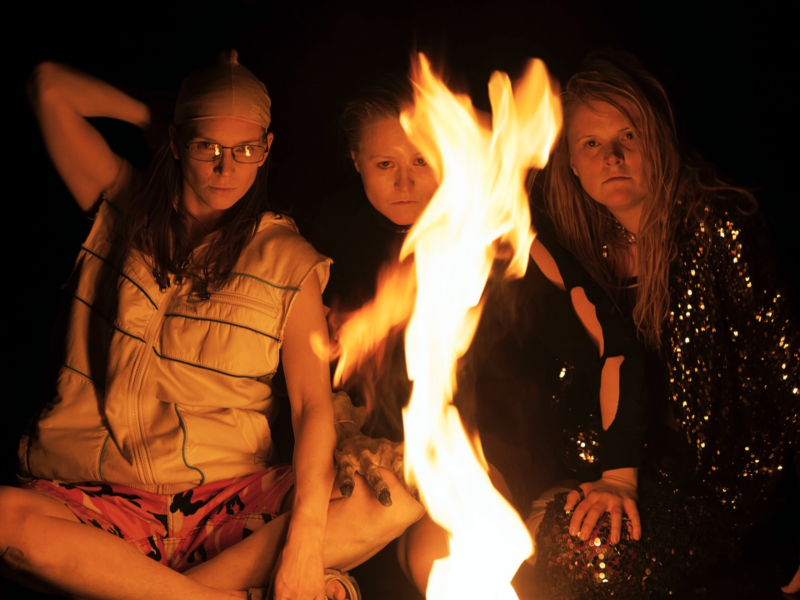 Ingeleiv Berstad, Ida Wigdel and Kristin Helgebostad enters the woods and dedicates themselves to the night sides of the human being and secret rooms with unconditional intensity and physical affection. Noise is the vibrating energy, the uncontrollable, dissonant forces accumulating in and around us, from expansive landscapes to the narrowest corners of the mind. Noise is not the exception; it is the rule. The visible and invisible, audible and inaudible impulses disturb, intensify, elude and reveal. These impulses, these spoilers, demand that we listen with the body, ready to move deeper into the forest. 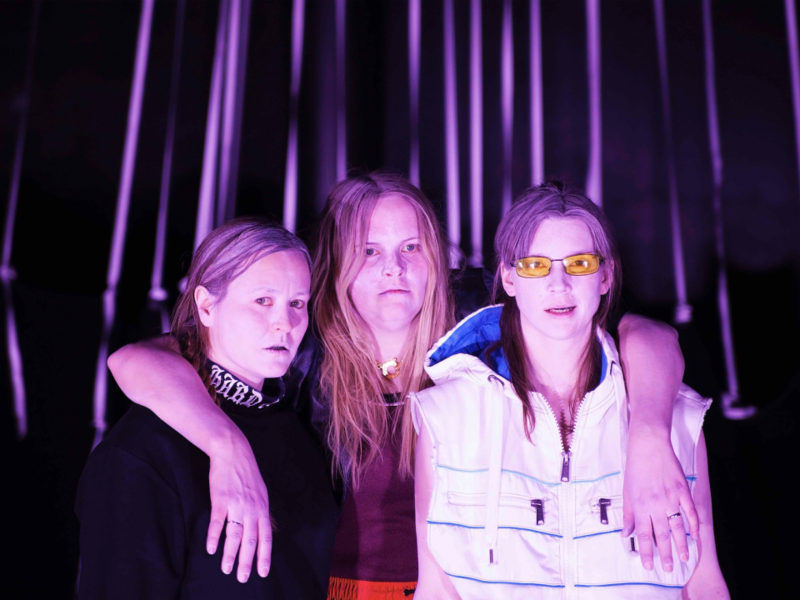 Ida Wigdel, Ingeleiv Berstad och Kristin Helgebostad är alla tre koreografer och dansare baserade i Oslo. 2013 skapade de sin första helaftonsproduktion, Jordjenta, med premiär på Black Box Teater i Oslo. Jordjenta har blivit uppmärksammad både nationellt och internationellt, och har spelat på festivaler som ImpulsTanz, Nordwind, Ice Hot, Spring Forwards, Motel Mozaique och Side Step Helsinki m.m. De var Aerowaves Priority Company 2015. Jordjenta har visats i flera städer i Norge, Tyskland, Nederländerna, Spanien, Österrike, Danmark och Finland. 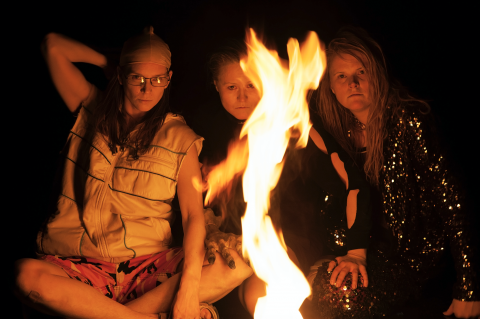 Koreografi och performers: Ida Wigdel, Ingeleiv Berstad & Kristin Ryg Helgebostad. Ljuddesign: Per Platou. Ljusdesign: Elisabeth K. Nilsson. Scenografi & Kostymdesign: Thale Kvam Olsen. Dramaturg: Melanie Fieldseth. Producent: Gulli Sekse. Med stöd av: Norwegian Art Council, Fund for Sound and Image. Samproducent: Black Box Teater.